As a dog trainer, Jordan Coulson brings a professional and clear perspective to canine behavior. He has worked extensively with working dogs, including cattle dogs, drug-sniffing dogs and bomb sniffing dogs. This has given him insight into the natural drives and behaviors of dogs in their natural state, doing what they were bred to do. He is a graduate of Triple Crown Dog Academy in Texas, where he learned to work with dogs of all ages and breeds using a variety of proven and innovative training techniques. His classes reflect his creative approach that is both enjoyable and productive. 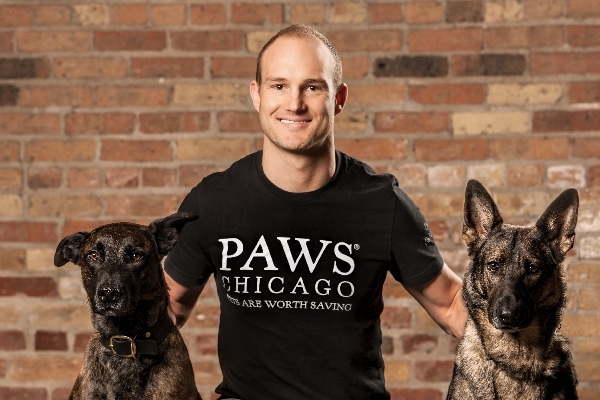 In 2014, Jordan joined PAWS Chicago as Canine Training & Behavior Manager. In this role, he teaches class to the public, works with dogs one-on-one and oversees volunteers in group training classes. He also helps train volunteers to support training, enrichment and behavior modification. Jordan’s dogs: Jordan has two dogs, Hayes and Viva. Hayes is a Dutch shepherd-Belgian Malinois rescue trained in narcotics detection. Viva, a German shepherd, is a FEMA-certified Search and Rescue dog. Fun Fact: Jordan is a half-American New Zealand native who originally came to Chicago as a professional rugby player. He represented the USA National side prior to the World Cup.